Sam has over 20 years of experience serving clients in various industries. Since 1992, Sam has worked for companies across the globe, acquiring skills in the areas of real estate, sales, consulting, operations, banking, accounting and finance. These skills have translated effectively into the business advisory and transition services offered by Premiere Practice Transitions. Upon graduation from the University of Cairo in 1992 with a Bachelors of Business Administration, Sam served as a Staff Accountant and Product Pricier for Giza Seed & Herbs, Inc. It is there that Sam gained invaluable financial management experience by performing analyses of accounts, recommending financial solutions and managing clerical staff. 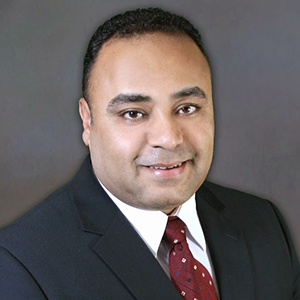 In 1999, Sam Soliman became a Personal Banker at TD Bank Group, Inc. where he excelled in Retail Banking operations and customer advisory services. After 5 years of strong performance in a range of finance and customer service oriented responsibilities, Sam decided to test his skills in a new industry: Real estate. Employed as a Real Estate Sales Consultant for London Properties LTD., Sam was able to learn and develop skills in various areas including real estate purchases and sales; negotiations of legal contracts; coordination of property closing, inspections, escrow accounts, and client interviews; and developing purchase offers. In 2014, Sam left London Properties, LTD. with a vast skill set and incredible knowledge of finance, real estate, customer service and management. He began working as a Sales and Finance Consultant for Penske Automotive Group, where he again demonstrated his expertise in customer service, negotiations and sales. Sam is currently enrolled in graduate school at the University of Phoenix, where he expects to earn his Masters of Business Administration in March of 2016. He is fluent in several dialects of Arabic, and enjoys tennis, international travel, billiards and volunteer work. The wide range of industry experience and skills that Sam has developed make him a valuable asset for Premiere Practice Transitions. He has extensive knowledge of negotiations, sales, management and consultation that allow him to serve all of our clients’ needs and facilitate successful and lucrative practice transitions.